WINDTECH Consultants provides consulting services in the area of solar effects, including the study of solar reflectivity, solar access, overshadowing and daylight. 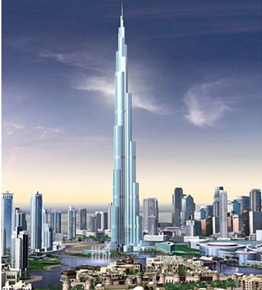 WINDTECH Consultants has undertaken over 300 such studies including a Solar Reflectivity Analysis on the Burj Khalifa Tower, which is currently the World’s tallest building. Solar glare from buildings is known to be a potential hazard to motorists. For this reason, Councils now generally require a study of solar reflectivity from large building projects and recommendations for solving potential glare problems. The method adopted by WINDTECH Consultants to examine solar reflectivity from buildings was developed by David N. H. Hassall. The Hassall technique involves the use of a glare protractor and reflection protractor which determine the amount of glare to be expected from any building surface and the degree of annoyance. The Hassall technique provides detailed information on the more critical aspects of the study. This in turn makes the study very efficient and also able to provide useful results with recommendations on the limiting reflective properties of facade materials being used as well as the time of occurrence of the critical levels of glare. Many local government authorities now require an assessment of the quality of the living spaces in new residential unit developments largely in terms of their energy efficiency and access to direct sunlight. WINDTECH Consultants has undertaken solar access studies for a large number of projects. Daylight analysis is carried out when concern is expressed with regards to the potential for excessive overshadowing by the surrounding buildings. This study is normally required where it is difficult to assess the deemed to comply provisions in various building standards due to the complexity of the openings to the sky, the presence of nearby buildings obstructing sky illumination or where the building has an irregular form. Assessment of the adequacy of natural lighting from the sky is compared against criteria on which the building codes are based. WINDTECH Consultants utilises either graphical techniques or for 3D models for more complex buildings and surrounds. We can also place a scale model including surrounds supplied by the architect into our Helioscope to produce high quality photographic prints of the shadows cast for the requested times and season(s). The exact times and seasons are determined based on the requirements of the relevant local authority. Usually the existing scenario is also presented for comparison.